jaisalmer the golden city is a beautiful town in the Indian state of Rajasthan. It is one of the largest districts in India and forms a part of the Great Thar Desert. The city has a dry climate with hot summers and cold winders and sparse rains. The city has a large variety of flora and fauna with poisonous snakes very commonly seen here. The Havelis and the Forts add beauty to the city and attract people form all over the globe to this beautiful desert city of Rajasthan. 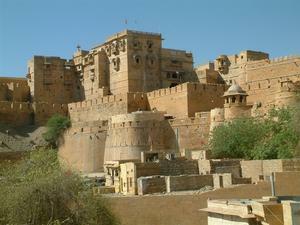 jaisalmer is popularly referred as the "the Jewel of the Desert" , is one of the most fascinating cities of Rajasthan. Also known as "the Golden City of India" , jaisalmer is popular for its centuries old magnificent forts, palaces havelis and amber-hued houses. jaisalmer is also known for its exotic sand dunes, offering exciting and unforgettable camel safaris. The city has a large number of hotels to cater to the accommodation and dining needs of the tourists. Some of the most wonderful hotels in the city include the Mandir Palace ,Narayan Niwas Palace, Mahadev Palce, Hotel Haveli and the Hotel Rawal Palace. jaisalmer tourism welcomes tourists from all over the world to have a visit in this wonderful historic city of Rajasthan. The city has a large number of tourist destinations the prominent of which includes the havelis and the Forts. Some of the most important tourist attractions in jaisalmer Rajasthan include " jaisalmer Fort" This fort is also known as “Sonar Quila” . The fort is over 800 years old and is made of golden yellow sandstone. Defended by 99 towers, the fort lies on Trikuta Hill and is approached through the Ganesh Pol, Suraj Pol, Bhoot Pol and Hawa Pol. There are many havelis and a group of Jain temples which dates back to the 12th Century AD.